When I drink Japanese beer, I usually go Asahi Super Dry (no love for Ichiban here, dude). Now thanks to Asahi, I will be able to swagger up to an Asahi Beer Robot and order a pint. As reported here earlier, Japan is preparing to make the bulk of it’s workforce made up of robots in the next twenty years. 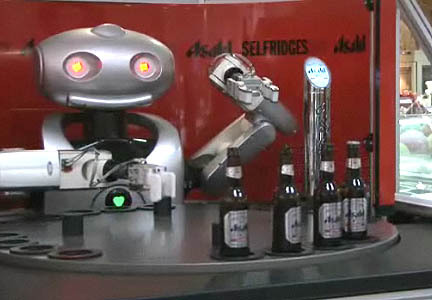 The robot smiles, poors draft or bottled beer, and even offers small talk. Let’s hope it doesn’t blast you with lasers if you don’t tip well. Check out the video via Channel Flip to see how Mr. Asahi serves ’em up.